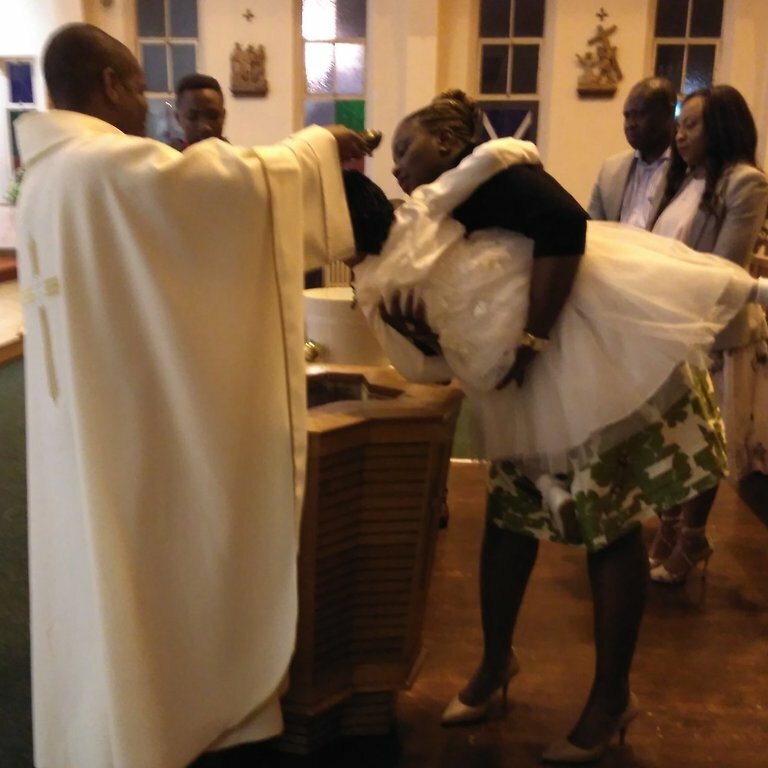 Many from the African Continent were present to celebrate as Aline was anointed with the oil of Chrism, confirming her Baptism and declaring her a member of the Catholic Church. 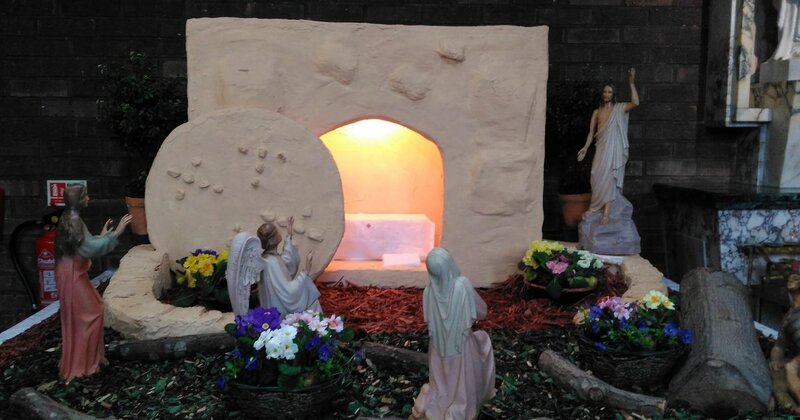 Earlier that day, Holy Saturday, the Polish Community from this Church and from the surrounding area flocked to the church to give their thanks and to ask God for Blessings on the year ahead. Glasgow is truly blest by having people who keep alive their different cultures . They bring richness to our city which welcomes all from countries near and far. Glasgow's Easter Message is one of Rejoicing in The Lord's Goodness and Spreading the Good News which enables Glasgow to Flourish by the Preaching of His Word and the Praising of His Name. Alleluia ! 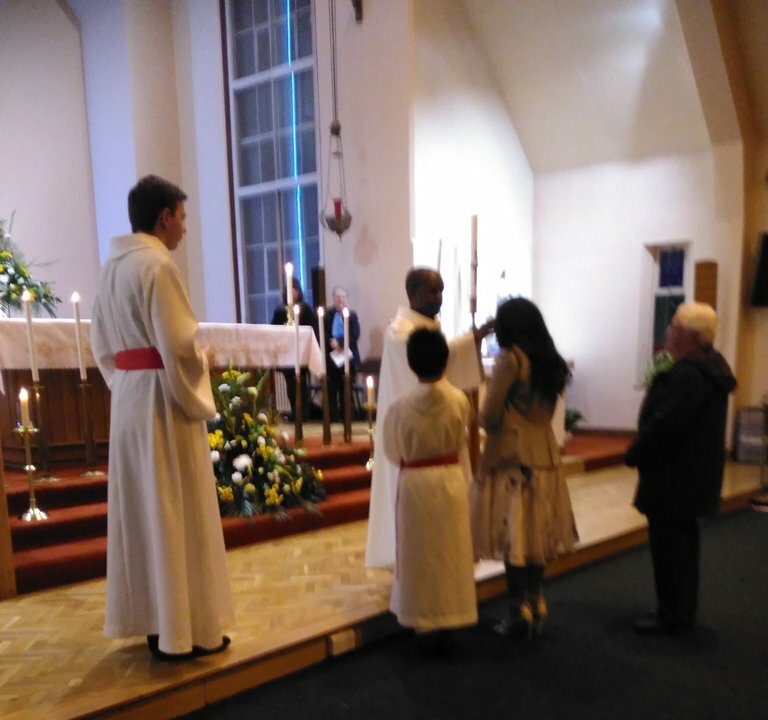 Alleluias rang out this Eastertide 2018, in the church of St Jude&St John Ogilvie in Glasgow's East End as Aline, with her four year old daughter, originally from Cameroon became members of the Catholic Church. 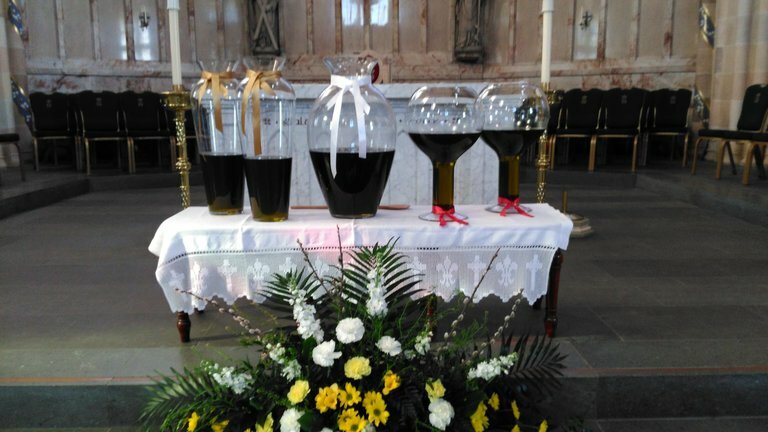 The two hour long service ended the Solemn Paschal Triduum at the end of Lent and Proclaimed the Day of Resurrection of the Lord Jesus. 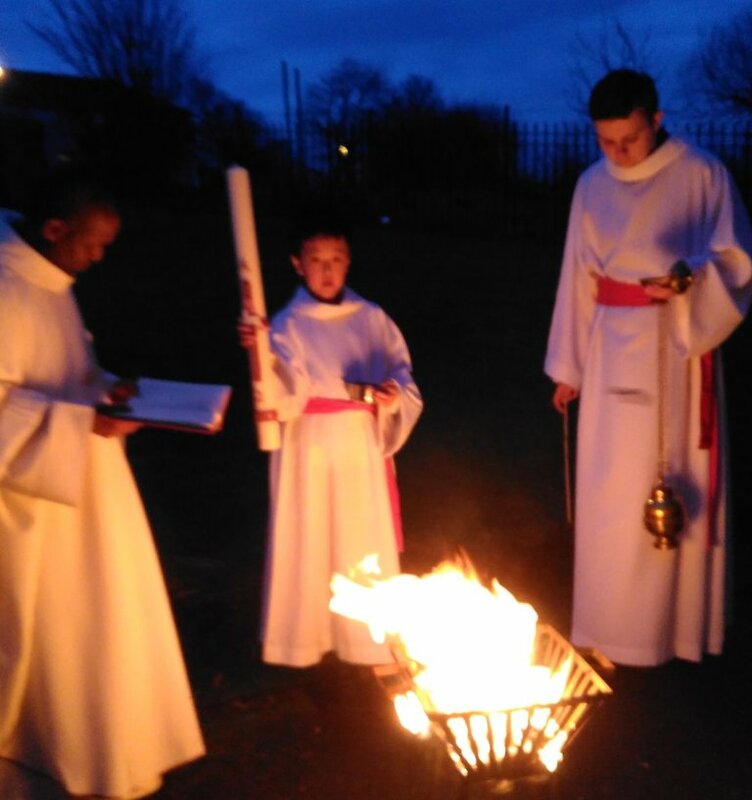 Beginning outside as the new Fire crackled in the wind, and from which the Pascal Candle was lit, we, the Congregation followed in procession with the Lit Candle into the Dark Church, proclaiming and singing " Christ be Our Light." We rejoiced with all Heavenly Powers and All Creation as we sang our Great Hymn of Joy and Exultation. Her younger child was baptised during the same Eucharistic Celebration. Her Husband and older boy looked on with pride and joy. New Life for all on Easter Night and most definitely for this family. Alleluia ! Keeping with their tradition they brought baskets adorned with beautiful linen and lace . 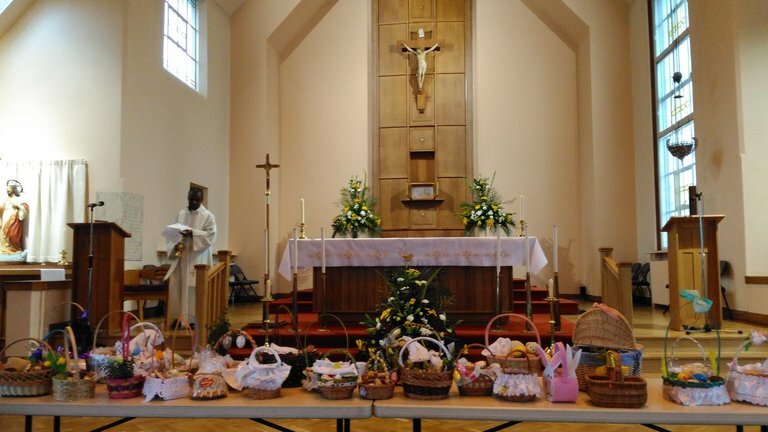 Inside the baskets were their home baked food, bread with a cross on it, butter in the shape of a lamb, eggs and sweets. To complete their season of fast during Lent and to proclaim their belief in the Risen Lord they listened to bible readings in Polish and English about the history of salvation. Their beautiful baskets containing food were blessed by the Priest. They partake of the contents of the baskets at home on Easter Day. Alleluia !